Owned by the widely popular Grand Circle Corporation, Overseas Adventure Travel specializes in adventurous tours for folks over 50, with group sizes ranging from a maximum of 10-16. This safari travels from South Africa’s Kruger National Park to Zimbabwe’s Hwange National Park (the country’s largest wildlife park) and Victoria Falls (where both the falls themselves and village life are showcased), then on to Namibia’s Impalila Island and Botswana’s Chobe National Park, home to 50,000 elephants. No reviews yet for this trip. Browse other reviews below for Overseas Adventure Travel (O.A.T. Tours). The Peru Amazon trip by Overseas Adventure Travel with extension to Machu Picchu was one of the best trips I have ever been on! The accommodations, the crew and all of the guests were great. South Africa You depart from the U.S. on an overnight flight to Johannesburg, South Africa. Today, arrive in Johannesburg. You will be met and transferred to your hotel for an overnight stay. This morning, you will fly to Nelspruit (Mbombela). Upon arrival, we will be transferred to our camp in Kruger National Park. The largest of South Africa’s parks, with a total area of 7,500 square miles, Kruger is also one of the largest parks in the world. Bordered by the Limpopo and Crocodile Rivers, the land spreads a stunning 200 miles at its widest point. Late this afternoon, we’ll get our first taste of this vast natural canvas in a game-viewing drive. Here we may spot herds of elephant and buffalo, antelope, nyala, and eland, the kind of game you travel to South Africa to see. Your game-viewing drives will be led by knowledgeable guides who know the best locations for viewing and are adept at helping you spot wildlife both near and far. We begin our day with an early morning bush-walk. Be on the lookout for species which live here in lesser numbers, including African wild dogs (of which only 150 remain). After returning to camp for breakfast, we'll have the rest of the morning and the early afternoon at leisure. After lunch, you'll enjoy a final afternoon game-viewing drive. Perhaps you'll see giraffes “necking”—a sport for young males showing off—or hear the clucking conversations of long-horned greater kudu. This evening, we enjoy dinner together at the camp as evening falls and we compare notes on all that makes it special to travel to South Africa. Today, you'll enjoy a full-day game-viewing drive in Kruger National Park. Kruger is home to 147 species of land mammals, the highest number in Africa, including all of the "Big Five": lion, elephant, Cape buffalo, leopard, and rhinoceros. Thousands of zebra roam the land here as well, but no species can keep up with the impala, which number more than a million here. After enjoying a picnic lunch in the park, our game-viewing drive continues in the afternoon. One needn't only scan the grasses for activity—the trees and sky are busy, too. More than 500 species of birds are found here, including what African birders call "The Big Six" (in answer to the famous mammals); the lappet-faced vulture, martial eagle, saddle-billed stork, kori bustard, ground hornbill, and the elusive Pel's fishing owl are all residents of the sprawling park. After breakfast, we'll depart camp and return to Nelspruit for our flight to Livingstone, Zambia. From there, we'll drive a short distance to Victoria Falls—where we will be met and transferred to our lodge near Hwange National Park, Zimbabwe's largest park. As we pass grasslands and acacia woodlands en route to our lodge, we’ll enjoy a taste of the unspoiled beauty for which Hwange is famous. Comparatively undiscovered, the bush country park is known for its herds of sable antelope, an elegant animal with large, graceful horns, which we may see on this first game-viewing drive. The evening is yours to spend at leisure before dinner at the lodge. Please note: If Day 6 of this itinerary falls on a Sunday, travelers will fly from Nelspruit to Johannesburg, with a connecting flight to Victoria Falls and a land transfer to Hwange National Park in Zimbabwe. Today, we rise early for breakfast before setting out for a morning game-viewing walk. In the afternoon, we'll return to our lodge to enjoy lunch and some time at leisure, before heading into the bush again for an afternoon game-viewing drive. During our safari, we'll soak in a variety of Hwange's habitats, from teak forests to palm islands to vast, savannah plains. Adding to your sightings from the day before, you may encounter a menagerie of animals which could include lion, leopard, cheetah, and more than 400 known bird species. We'll return to our lodge for dinner. Today, we have the opportunity to enjoy a full day of game viewing with one of our professional guides. During this drive, you will learn about the region's flora and the intricate cycle of life in the bush. We will learn to identify which animals have passed through the area. Our expert guides may also expound on everything from how elephant dung can be used as mosquito repellent, to how the giraffe is able to eat leaves off of the thorny acacia trees. After enjoying a packed lunch at the park, we journey into the bush once again to continue our game-viewing drive. Perhaps we’ll spot elephant, buffalo, eland, wildebeest, and impala, before we return to our camp for dinner. Depending on the season, we might even be lucky enough to dine with a view of elephants grazing nearby. After breakfast this morning, we depart our lodge and travel overland to Victoria Falls. Mosi-oa Tunya, as the falls are known in the local language, live up to their name as “the smoke that thunders.” On a clear day, you can see the mist from these crashing waters from more than 50 miles away. That’s not surprising when you consider the size of the falls: nearly twice as high as Niagara, as well as one and a half times as wide, generating three times as much water. With 1.4 billion gallons of water per minute passing over its edge at peak flood, Victoria Falls is the largest curtain of water in the world. This afternoon, on our guided tour, we explore walking trails and lookout points—each with different views. There are five main cataracts, including the most dramatic, the Main Falls and Devil’s Cataract. Considering the endless spray here, it may be a good idea to wrap your camera equipment, cash, and other valuables in plastic before our discoveries. We’ll find the rain forest surrounding the falls is particularly lush as a result of the insistent moisture, yielding profuse flora, including ebony, fig trees, and many flowering species. Dinner is at a local restaurant tonight. Today, we have several opportunities to gain insight into daily life in Victoria Falls. After breakfast, we'll set out to spend some time at a village market, which is partially supported by Grand Circle Foundation to benefit the local economy. Following our market visit, we'll venture to Jabulani Primary School, where we’ll have a chance to interact with students and staff, enjoying a glimpse of Zimbabwe’s future. We'll spend additional time exploring the community and enjoy lunch at a local restaurant. With the rest of the afternoon at leisure, you might choose to explore the town of Victoria Falls. Or perhaps, join one or more optional tours, which include an Elephantback Safari or a Helicopter ride over Victoria Falls. Dinner is at a local restaurant. With a full day at leisure, you might choose to continue your explorations of Victoria Falls. In the center, you can find local handcrafts, such as the famous Shona stone carvings and a variety of wooden carvings. You’ll also find a selection of brilliant African textiles, malachite, basketry, and more—and don’t be afraid to barter, which is both expected and fun. (You can even use American goods like T-shirts, sweatshirts, and baseball caps with designer logos for “currency”). Please ask your Trip Leader for advice about where else it may be appropriate to barter in this manner. Perhaps you’ll decide to take another one of our optional tours from the choices offered on Day 10. We enjoy dinner this evening at a local restaurant. After breakfast this morning, we travel overland to Kasane, Botswana, where we transfer by boat for our 3-night discovery of Impalila Island. Impalila Island is one of the gems of the Caprivi Strip, a slender eastern arm of Namibia extending to Zambia and Botswana. We arrive in time to settle in and enjoy lunch together at the lodge. Our setting is beneath the limbs of a 700 year-old baobab tree that once sheltered 19th-century explorer David Livingstone. This afternoon, discover the serenity of Impalila, surrounded by 60 miles of waterways—including the Zambezi and Chobe Rivers. With its interconnected rivers and channels varying in personality from rapids to limpid lily ponds, Impalila's environs offer a bounty for lovers of nature. We'll explore its flora and fauna during a sundowner cruise along the Zambezi River. We return to our lodge for dinner together this evening. Early this morning, you might choose to experience what life is like on Impalila Island, during a walk through a local village. Or perhaps you'll opt to explore the Zambezi River on a boat cruise. The Caprivi Strip is especially well known for bird-watching, with 450 species found here from the Heuglin's robin to Yellow-bellied bul-buls and more. This is the best time of day to spot the black and copper-tailed coucals (a cousin to cuckoos). As you ply the waters of this legendary river, you may encounter crocodiles, hippos, and the many elephants that thrive here. After lunch back at camp followed by time for tea in the afternoon, your choices continue. You may opt to take a river cruise or explore the island by foot. From your boat, keep your eyes peeled for the Roan antelope, bushbuck, buffalo, and puku who call the Zambezi riverbanks home. We enjoy dinner together at our lodge this evening. After breakfast this morning, we stroll to a nearby village to learn about traditional daily life in the Caprivi Strip. Depending on the village and season, this may include an introduction to the use of medicinal plants and trees in this region. This morning is sure to offer rich insight into the rhythms of local life. After lunch, you may explore the Chobe River by boat or go fishing, taking your shot at snagging the tricky Tigerfish, the king of the river. With its striped silver flank and enormous, sharp teeth, the Tigerfish makes quite an impression. It is said that Tigerfish are among the most clever river fish and can escape from hooks like swimming houdinis. Tigerfish typically tend to weigh just a few pounds, but every season someone raises a monster—up to 20 pounds—from the waters. Whether you seek the rich variety of wetland fowl, from herons to ibis and crakes, or perhaps a chance to angle for fish, the afternoon offers you the perfect leisurely pace. On either excursion, you'll likely be under the watchful gaze of noble Fish Eagles. Tonight, we dine together at our lodge. After breakfast and your choice of either a nature walk or boat cruise, we bid farewell to Impalila Island, returning by boat to Kasane. We’ll have time to explore the town before arriving at our lodge in time for lunch. This afternoon, we enjoy our first game-viewing drive in Chobe. Chobe National Park was the first national park established in Botswana and it remains one of its largest, with 4,500 square miles of area. The vast size allows for incredible diversity of terrain, from floodplains and marshes to forest and mopane woodlands. More than 50,000 elephants call this park home, making it one of the world’s largest populations. The next two safari days feature a wealth of game-viewing by land. We’ll begin our morning with breakfast at our lodge before setting out for a game-viewing drive in Chobe National Park. Then, we return to our lodge to relax for a quiet siesta during the heat of the day, followed by lunch. Late afternoon, we'll enjoy another game-viewing drive in the park. 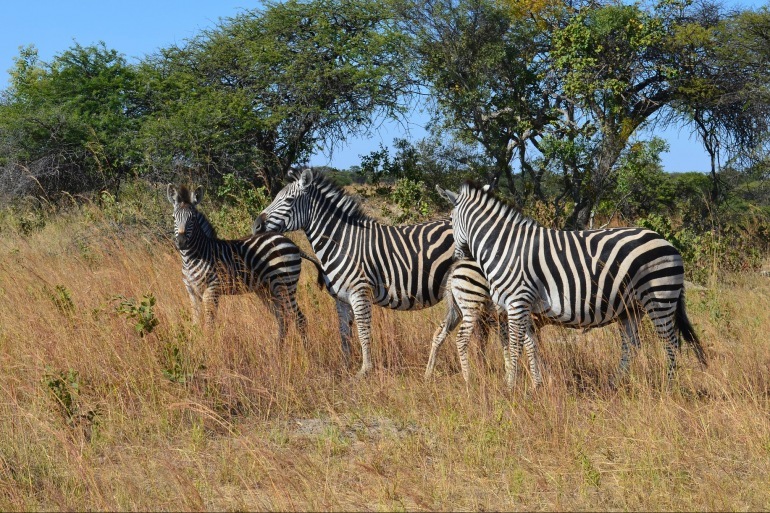 In addition to spotting elephants, we'll see zebra, Cape buffalo, wildebeest, among many other species. But it's not just land animals that fill the scene. Eagles, plovers, and bee-eaters wing through the clear air. In the evening, we return to camp to enjoy dinner together by candlelight. We follow our traditional pattern today, following the wildlife in safari vehicles this morning and enjoying a game-viewing boat cruise along the Chobe River in the afternoon. We're likely to encounter Chobe’s famed elephants—which are the largest in size of any elephant breed, yet have the smallest tusks. And we’re sure to see some of the beast’s African peers, perhaps including buffalo, hippo, red lechwe, sitatunga, and crocodile. Over dinner at our lodge together tonight, we can compare notes on all we’ve seen during these safari days. After breakfast, we travel overland to Kasane. We then drive to the Victoria Falls airport and board our flight to Johannesburg. Both the flight for the post-trip extension Cape Town & the Cape of Good Hope and the return flights to the U.S. depart in the early evening. Sprawling across more than 5,000 square miles, the lush Okavango Delta is truly unlike any other place on Earth. The fan-shaped “Jewel of the Kalahari” beckons wildlife and adventurers alike with its diverse terrain. In landscapes where elands play, birds wing overhead, and even rare Black and White rhinoceros can thrive, you’ll explore by land and by mokoro boat, enjoying the rich flora and fauna from an array of perspectives. Opt for an Elephantback Safari excursion at the famed Victoria Falls Private Game Reserve, which teems with wildlife. Upon arrival, learn how the elephant hands, or grooms, care for their animals, and participate in a short training session. Then “saddle up”—high up—on your elephant, and follow ancient game trails lined with flora and fauna. The elephant groom informs about the nature you find along the way, as well as the magnificent, gentle elephant providing your safe transport. Cancellation Charges Generally: Unless otherwise stated next to the program’s rate chart, you will receive a refund equal to your Trip Price less the following per-person charges. Charges shown include the $300 administrative fee. Not appropriate for travelers using wheelchairs, walkers, or other mobility aids. Not appropriate for travelers in need of CPAP machine.